LeBron James has been a Los Angeles Laker for all of two games now, and aside from the 0-2 start to the NBA season, he probably didn't want his first home game in LA to end in a fight. While playing the Houston Rockets on Saturday night at the Staples Center, Lakers forward Brandon Ingram fouled James Harden late in the fourth quarter as the Rockets guard went in for a layup. A frustrated Ingram then pushed Harden from behind and the two argued back and forth. Tensions appeared to ease as Ingram was escorted away by his teammates. 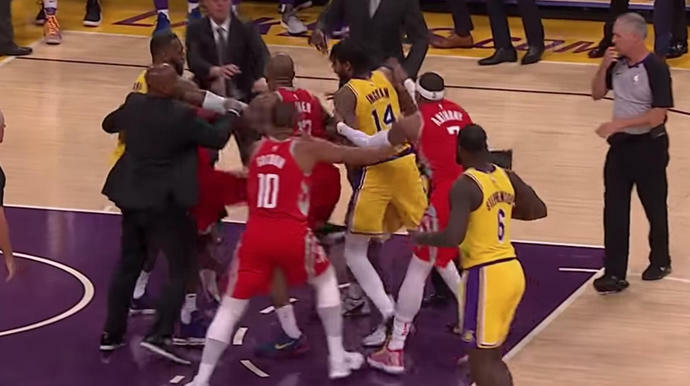 Elsewhere on the court, though, Lakers guard Rajon Rondo and Rockets guard Chris Paul were still going at it. Paul stuck his finger in Rondo's face and pushed his head away. Paul and Rondo then exchanged punches, which led the teams to swarm. Ingram, who had been calmed down, raced over to the fight and threw a punch at Paul. Paul, Ingram and Rondo were all ejected from the game and are likely to be suspended for throwing punches. The league has not made any announcements yet. James, who spent most of the brawl trying to play peacemaker, ended the night with 24 points, but the Lakers fell to the Rockets 124-115. Maybe not that bad, but it would be foolish.